I recently asked the question “Is Violife the best melting cheese in the UK?” and many people replied in the affirmative. However, some readers asked a question of their own. They wanted to know where in the country they could buy this vegan cheese. Well, I’m happy to report I have an update on where you can pick up this plant-based favourite. A super considerate reader named Jon reached out to me today to let me know he found the Violife brand in an Asda store. 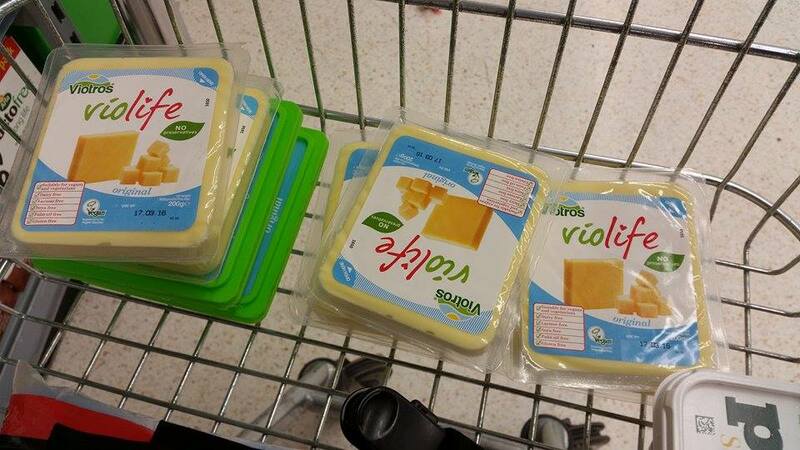 This vegan cheese is spreading across the UK faster than I can handle! Check out Jon’s haul of the good stuff in his shopping trolley. Have you seen Violife in your local Asda? Also available in Tesco! Couldn’t believe my eyes when I saw it there! Never mind Asda, I’ve seen it in my Tesco! Very impressive. you can also get it in Tesco but it’s curently on offer in Asda. Tesco have it online and in one of their larger supermarkets in Lewisham, noticed it about a month ago – keeps selling out though! Surprised at Asda, never known them to be particularly vegan friendly – milk in their samosas?! They must have noticed the commercial demand in Leeds and responded. Would like to know if this is nationwide, anybody? I’ll find my local Asda and have a look. Oh it’s definitely great that it reached ASDAs 😀 !! That leaves Sainsbury’s as the main other big supermarket not selling any dairy-free cheese – Tescos sell Violife & Sheese (the latter branded as their own free-from); Morrison’s do Cheesly; Waitrose sometimes has dairy-free cheese.